After with fitted furniture – with oodles more storage space! 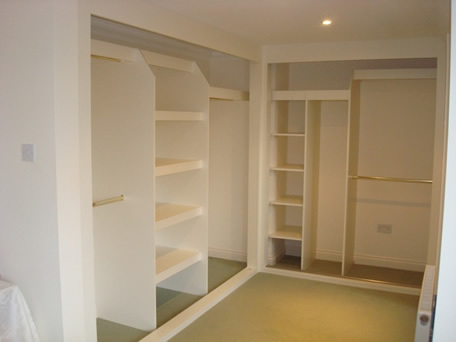 Custom World’s floor to ceiling wardrobes always provide more storage space…The most important benefit of having our fitted furniture is the extra storage space afforded by floor to ceiling wardrobes versus the conventional free standing equivalent. Actually, we would go as far as to say that our built in wardrobes can give you as much as 50% more storage space, when you take account of the fitting from floor to ceiling and wall to wall. Free standing furniture not only stands proud of obstacles such as skirting boards and coving, but also is made with a top, so therefore provides less storage space. Floor to ceiling wardrobes lead the way in a room with angles and sloping ceilings, as per the image above. In this case the furniture has been exactly fitted to the slope of the ceiling, thereby maximising the storage space. It is likely that in rooms like this one, free-standing furniture wouldn’t actually work, so built in wardrobes are then the best and only viable option. Where you also gain additional storage space by having fitted furniture, instead of freestanding furniture, is if you have a property with particularly high ceilings. Whilst it is possible to get higher than average freestanding furniture, it will always have a top built in and is limited by its own dimensions, whereas fitted furniture is usually built from floor to ceiling. Whether you have hinged door wardrobes or sliding door wardrobes, the furniture is built with the aim of maximising your storage. Where your furniture is built in, you can use every inch of space, including the corners of your rooms. The interiors you choose can be made to any size or shape you like, so if you need deep shelves or shallow drawers, for example, we can accommodate this at the design stage, so your furniture will be made specifically for you. Subject to the space you have, you can even change the depth of your wardrobes to match your clothes and to suit your storage needs. What you choose for the interiors of your wardrobes is completely flexible and can include hanging, internal drawers, shelves, tie racks, shoe racks, trouser rails and more and in any combination to match your storage requirements. Also, your built in wardrobes are usually fitted whereby your existing walls are used the backs and sides, thereby providing the maximum space inside. 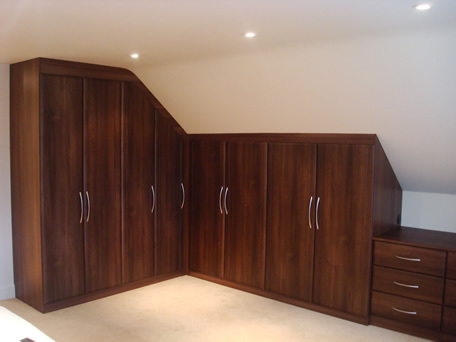 However, if you’d prefer to have fitted backs on your wardrobes, we can build these in for you too. You can arrange a FREE no obligation design appointment to discuss your requirements with one of our experienced designers. They will be able to answer all your questions, discuss your options and work with you to design your furniture the way you want it and to make sure that your storage fits your needs.